I’ll be upfront here. While many like Williams, with their “plucky underdog” status and stridently independent approach, they have never been my among my favourite teams. To the extent that I have ever liked them, it has been as the anti-Ferrari. In other words, I like them about as much as I like McLaren, which is not very much — but hey, at least they can beat Ferrari. Today, Williams can’t beat Ferrari, so I am rather indifferent about them. But at a time where the majority of the grid is made up of manufacturers — of cars and drinks — even I can see that there is something romantic about Williams. I think it would be good to see them at the front again. But if I was a fan of the team, I would probably have well and truly lost patience by now. Every year the team says, “just wait — next year we’ll be back”. They spend all winter making positive noises. And then when it comes to the big day itself? They are even slower than they were before. When they last won a Constructors’ Championship in 1997, Williams had won more of them than Ferrari. The record was staggering — nine Constructors’ and seven Drivers’ Championships in just 20 seasons. It was an utterly fearsome record. At that stage, Williams had won races in all but two of its seasons — its very first in 1978, and a brief drought in 1988 when the team had to make do with inferior Judd engines after Honda jumped ship to McLaren. Even then, Nigel Mansell managed to wring a couple of second place finishes out of it, which is more than can be said for what came after 1997. Once again, Williams was left in the lurch after the departure of the front-running engine manufacturer — this time Renault. To make matters worse, chief designer Adrian Newey left Williams to join McLaren. 1998 was a year of continuity for Williams, in all the wrong ways — using what were effectively year-old Renault engines and what some said was the 1997 chassis adapted for 1998 regulations. In 1999 the team faced further difficulties with Alex Zanardi struggling to adapt to F1 after a successful time in ChampCars. While the wins dried up, this difficult spell was thankfully short lived, as in 2000 Williams forged a new partnership with BMW. 2000 was a learning year for all concerned, but successes came between 2001 and 2003, when Williams returned to winning ways. Williams were even strong title contenders in 2003, with four victories and nine podiums, Williams were a strong player in a tight three-way battle for the championship. As unlikely as it seems today, Juan Pablo Montoya was almost a World Champion! Unfortunately, things started to go pear-shaped again in 2004. A radical “walrus nose” concept brought little in the way of performance, and a more conventional design was brought out midway through the season. Montoya managed to win the final race in Brazil, but this race remains the team’s last taste of success. The brightest spot has been 2007, when a consistent set of results from Nico Rosberg helped the team bag a commendable fourth place in the Constructors’ Championship (although that was after McLaren’s disqualification from the Championship). Apart from that, Williams have become a fixture at the back of the midfield — if you can call 8th out of 10 teams the “midfield”. All the while, the excuses came, and fans were reassured: “next year is our year”. And next year comes and everything is all the same. Even if they trick people into thinking they’re fast by topping Friday Practice times, as Williams did in the first half of last season, people soon become wise to the fact that the car is not truly capable of it. Before, there was always a positive spin to put on the situation. In 2009, Williams were bad — but at least Renault were worse and BMW weren’t much better. In 2008 people were more concerned with the alarming lack of pace in the Honda. 2006 was regarded as a tough deal for Williams, struggling with apparently sluggish and unreliable Cosworth engines. It’s difficult to sugar-coat this year’s results in the same way. Although seventh doesn’t sound too bad, in effect the only teams that are behind them are either new (in the case of Virgin, Hispania and Lotus), facing hugely difficult political and financial constraints (Sauber) or have designed their own car for the first time (Toro Rosso). The shocker is that Williams are even being compared to teams like this. Meanwhile, Force India look a great deal more convincing, and Renault have again leapfrogged Williams and look like potential challengers to the top four teams. Indeed, Toro Rosso even look like they can realistically challenge Williams on the racetrack, particularly with a couple of feisty young drivers who are stepping up to the plate in style, particularly in the case of Jaime Alguersuari. Meanwhile, in China Nico Hülkenberg finished behind the Lotus of Heikki Kovalainen. It seems as though Williams allowed arrogance to get the better of them. It was always someone else’s fault. But increasingly, Williams have been made to eat humble pie. Williams lay the blame for their early-2000s dip at the door of BMW. This ended in an acrimonious split in 2005, by which time each party had become convinced that the other side was not pulling its weight. But BMW did a pretty good job when they joined forces with Sauber, the disappointment of 2009 notwithstanding. Meanwhile, Williams became inert — a permanent fixture of the midfield. Of course, if it wasn’t the engine’s fault, it was the drivers’ fault. I was very interested to see Frank Williams admitting that, in the light of Mark Webber’s recent successes, the team was too hasty to lay the blame at the door of its driver for their average spell in 2005 and 2006. When we had him obviously our car was a disappointment and we felt he was part of the problem. He probably wasn’t actually, with hindsight. The major point was that the car had problems. I think the Williams of today is a great deal less arrogant than the Williams of four or five years ago. But now the damage has been done. Is there a way back to the top for this proud team? 13 years on from its last Championship success, it’s difficult to see. Already, there are rumours that Williams are unhappy with Cosworth (just like in 2006). Rumours are linking them to a partnership with Renault. Williams were linked to Renault last year too, and Frank Williams confessed that the prospect of “Williams Renault”, a reminder of the team’s most dominant period in the 1990s, was exciting. Other rumours link Williams to a partnership with Porsche, with whom they have collaborated on kers. But the problems run deeper than the matter of their engine supply, as surely the lessons of the BMW split show. Despite all of its history and past successes, Williams have tried and failed to recover for too long now. Sadly, it seems as though this year Williams have to make do with racing against the likes of Sauber, a zombie team that is on emergency life support, and Lotus, a team that didn’t even exist a few months ago. I hope they can make it. 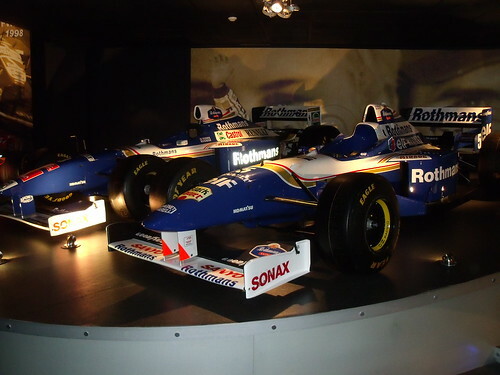 I was privileged enough to be invited to the Williams factory and museum last year. The museum is a wonderful place, brimful of some of the most successful grand prix cars there have ever been. The team only goes back just over 30 years, but it is such a huge part of Formula 1’s history. It would be such a shame if Williams were stuck at the back of the grid forever. Williams need to try find the ‘new’ Brawn or Newey. Someone who is an innovator & is going to spot the things that no one else has, to give Williams the edge. And really, they need to work out some sort of stable engine deal – even if that means letting a manufacturer buy into the team. You can’t be a front runner without that sort of stability & the Cosworth is only ever a stop gap solution for Williams. If I were Frank Williams, with all the rumours about VW/Porsche etc to enter into F1 in 2012, I’d be over in Germany glad handing the VW execs. Good points Pink Peril. The question for me (which I didn’t mention in the post) is why isn’t Sam Michael the new Brawn or Newey? And if he won’t become one, why is he still at Williams? Exactly. Michaels has had years to turn Williams around & has gone backwards really. They have lost their major sponsor, lost their engine supplier, and are hanging onto their last shreds of credibility. I wouldn’t say Michaels is solely responsible for all of that, but certainly he is the one who needs to sort it out.